The 29-year-old man detained after a flatbed truck zoomed down a popular lower Manhattan bike path, killing at least eight people and injuring nearly a dozen, left a note in the vehicle claiming he committed the attack for ISIS, according to law enforcement sources. 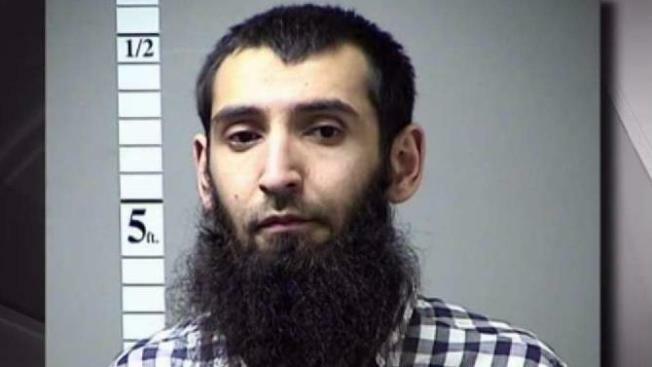 Authorities said the man -- identified by sources as Sayfullo Habibullaevic Saipov, who was an Uber and commercial truck driver living in Paterson, New Jersey -- is thought to be a "lone actor" in the attack in the Hudson River Greenway on Tuesday afternoon. U.S. counterintelligence officials added that no group has taken responsibility for the attack. The Uzbek national, who is a permanent U.S. resident, then shouted "Allahu Ackbar," got out of the rented truck and was seen running through traffic on West Street with a pellet gun and a paintball gun before being shot in the abdomen by a police officer on patrol and taken into custody. He's being treated at Bellevue Hospital. A family friend described the suspect as calm and hard-working, while President Donald Trump derided him as "sick and deranged." "We are not like him," said Mohammed Ghaith, who goes to the mosque. "Not harmful or anything like that. I don't know what he's been through or what he went through but we should all be like peace." Kobiljon Matkarov, a Facebook friend of Saipov's, told NBC News that the two met while they were both living in Florida. Uber said Saipov had passed a background test to drive for the service, and that he had been banned from accessing the app after Tuesday's attack. The company added that it is reviewing Saipov's history with the service and cooperating with the FBI. Anyone with information on Saipov or the attack is asked to call Crime Stoppers at 1-800-577-TIPS or the FBI's tips hotline at 1-800-CALL-FBI.